Step in the box and let’s play ball when you buy beep baseball equipment from the Denver Beepball Group! The Denver Beepball Group is pleased to be the sole manufacturer of beep baseballs, buzzing bases and single and multi-ball charging equipment. For 25 years, the hard-working volunteers of the Denver Beepball Group have skillfully assembled beep baseballs and buzzing bases to support the competition and camaraderie of the sport of beep baseball. 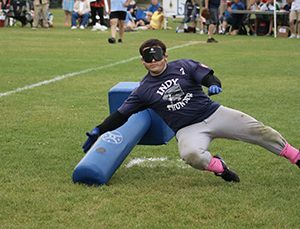 Thanks to their time and talents, hundreds of blind and visually impaired athletes around the world enjoy safe, accessible game play each time they step on the field. The Denver Beepball Group is the official provider of beep baseballs and buzzing bases for the National Beep Baseball Association and the World Series of Beep Baseball. Why should I order my beep baseball equipment from the Denver Beepball Group? Beep baseball is a demanding sport, filled with action and energy through every pitch. Quality equipment is essential to keeping your players and volunteers safe, and nobody knows beep baseball equipment better than the Denver Beepball Group. Purchasing beep baseballs, buzzing bases and charging equipment from the Denver Beepball Group ensures you’re buying beep baseball equipment that’s built to withstand every hit – at a fair price. This equipment is the official gear used by beep baseball athletes across the world. Whether it’s for a school, organization or an athlete honing their skill, let the Denver Beepball Group provide official beep baseball equipment to get you in the game. Beep baseball $35.00 USD A one-pound beeping baseball. Buzzing bases $300.00 USD Pair of buzzing base units, padded cylinders, base operation unit and wires. Shipping is not included in price. Multi-ball charger $45.00 USD Can charge up to 10 balls simultaneously. I understand shipping charges are not included with the cost of my buzzing bases and that I will be billed separately for shipping once the Denver Beepball Group creates a shipping quote for me.